The black sandshell was once common in all but the smallest rivers in Minnesota (Dawley 1947). Although Bright et al. (1990) found dead specimens at 18 sampling points on the Minnesota River, indicating the former broad range of the species, only 1 live specimen was collected. Thiel (1981) cited evidence of declining numbers in Pools 3-9 of the Mississippi River. Bright et al. (1994) found the black sandshell live or recently dead at each of 24 sampling stations in the Mississippi and Crow Wing rivers upstream of Little Falls, Minnesota. The species is apparently still doing well in the Chippewa River where 56 live specimens were found at 12 sites, and evidence of recruitment was observed (Bright et al. 1995). The black sandshell has also been recently reported from several northern rivers. The St. Croix, Cloquet, and Whiteface rivers appear to be the last strongholds for this species in the state (Doolittle 1988). Given its decline and the degradation of its habitat, the black sandshell was listed as a special concern species in Minnesota in 1996. The shell of the black sandshell is elongate, moderately thick, and up to 20 cm (8 in.) long. The outside of the shell is smooth, shiny, greenish or black, and often rayed. The beak sculpture has a few faint double loops that are usually unnoticeable. This species is sexually dimorphic, with females having a more truncate posterior and males having a more pointed posterior. The pseudocardinal and lateral teeth are well developed, and the inside of the shell is white, purple, or a combination of both colors. 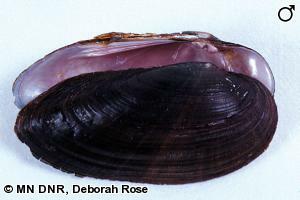 The black sandshell is larger and more elongate than the pondmussel (Ligumia subrostrata), and darker than the yellow sandshell (Lampsilis teres). It can be distinguished from the spectaclecase (Cumberlandia monodonta) and the spike (Elliptio dilatata) mussel by its smooth, shiny, rayed outer shell. The black sandshell's obscure beak sculpture also helps distinguish it from similar species. The black sandshell is usually found in the riffle and run areas of medium to large rivers in areas dominated by sand or gravel. Mussels are long-lived animals. Members of many species may live for several decades and in some instances, a century or more. They spend most of their lives buried in the bottom sediments of permanent water bodies, and often live in multi-species communities called mussel beds (Sietman 2003). Mussels are primarily sedentary, but they can move around with the use of their foot, which is a hatchet shaped muscle that can be extended out between the valves (shells). A mussel will burrow its foot into the sediment and then contract it to pull itself slowly along the bottom of its aquatic habitat (Sietman 2003). Mussels eat by filtering bacteria, protozoans, algae, and other organic matter out of the water. They draw water into their body through their incurrent siphon, remove food and oxygen with their gills, and then expel the filtered water through their excurrent siphon. Food particles are carried to the mussel's mouth by tiny hairlike cilia located on the gills. Waste is expelled through the excurrent siphon (Sietman 2003). Mussels have a complex and distinctive reproductive cycle. Males release sperm into the water, which are drawn in by females through their incurrent siphon. Fertilized eggs are brooded in the female's gills, where they develop into tiny larvae called glochidia. The black sandshell is bradytictic, with females brooding their young long-term from August through July before they are released as glochidia (Ortmann 1919). Once the glochidia are expelled from the female's gills, they attach to fish gills or fins by clamping onto them with their valves. The glochidia live as parasites on the host fish until they develop into juvenile mussels, at which point they detach from the fish and fall to the streambed as free-living mussels. Host fish for the glochidia of the black sandshell include the bluegill (Lepomis macrochirus), largemouth bass (Micropterus salmoides), sauger (Stizostedion canadense), and white crappie (Pomoxis annularis) (Watters 1994). Degradation of mussel habitat in streams throughout the black sandshell's known range is a continuing threat to this species. Declines in habitat conditions are associated with management of the Mississippi River as a navigational canal, and with non-point source water pollution and sediment pollution. Dams, channelization, and dredging increase siltation, physically alter habitat conditions, and block the movement of fish hosts. The black sandshell is also being impacted by the infestation of non-native zebra mussels (Dreissena polymorpha) in the Mississippi River and its tributaries. Zebra mussels can attach themselves in large numbers to the shells of native mussels, eventually causing death by suffocation. Further survey work in rivers where the black sandshell was formerly documented is needed to verify its status in the remainder of its historical range. A 10-year statewide mussel survey initiated by the Minnesota DNR in 1999 resulted in a better understanding of the black sandshell's ecology and current status in Minnesota. Additionally, over 500 black sandshells were collected from zebra mussel infested habitats in the Mississippi River in 2000 and translocated into areas of the Mississippi River south of the Twin Cities, where habitats were devoid of zebra mussels. Bright, R. C., C. Gatenby, D. Olson, and E. Plummer. 1990. A survey of the mussels of the Minnesota River, 1989. Final report submitted to the Natural Heritage and Nongame Research Program, Minnesota Department of Natural Resources. 106 pp. Bright, R. C., C. Gatenby, R. Heisler, E. Plummer, K. Stramer, and W. Ostlie. 1995. A survey of the mussels of the Pomme de Terre and Chippewa rivers, Minnesota, 1990. Final report submitted to the Natural Heritage and Nongame Research Program, Minnesota Department of Natural Resources. 131 pp. Bright, R. C., T. Atkinson, and C. Gatenby. 1994. Survey of the mussels of the Otter Tail and Pelican rivers, Minnesota: the data. Report submitted to the Minnesota Department of Natural Resources. 191 pp. Dawley, C. 1947. Distribution of aquatic mollusks in Minnesota. American Midland Naturalist 38:671-697. Doolittle, T. C. J. 1988. Distribution and relative abundance of freshwater mussels in the Saint Croix National Scenic Riverway. Final report submitted to the Natural Heritage and Nongame Research Program, Minnesota Department of Natural Resouces. Unpaged. Ortmann, A. E. 1919. A monograph of the naiades of Pennsylvania. Part III: Systematic account of the genera and species. Memoirs of the Carnegie Museum 8:1-384. Sietman, B. E. 2003. Field guide to the freshwater mussels of Minnesota. Minnesota Department of Natural Resources, St. Paul, Minnesota. 144 pp. Thiel, P. 1981. A survey of unionid mussels in the upper Mississippi River (pools 3-11). Technical Bulletin 124. Wisconsin Department of Natural Resources, Madison, Wisconsin. 24 pp. Watters, G. T. 1994. An annotated bibliography of the reproduction and propagation of the Unionoidea (Primarily of North America). Ohio Biological Survey Miscellaneous Contributions No. 1, Columbus, Ohio. 158 pp.